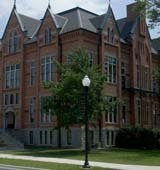 Situated 50 miles from Toledo in an Ohio town of the same name, Tiffin University is a private school offering numerous programs including business, liberal studies and criminal justice. Tiffin enrolls about 750 full-time undergraduates as well as about 500 part-time students. Their unique law enforcement program allows students to acquire real world certification and experience in just two years. Describe the type of student who should not attend Tiffin University and explain why. none. The campus has a large diverse group of students including international students. As long as you are willing to work on your goals for graduation you should be successful. Describe the type of student who should attend Tiffin University. Why? Any student is wants a diverse, small, student centered campus. They have study abroad opportunities, internships for upper class students, and students are encouraged in their studies and campus involvement. What is a typical Tiffin University student like? Describe the type of person that should attend Tiffin University. What are the top 3 reasons someone should attend Tiffin University? What was a typical Tiffin University student like in high school? Describe the type of person that should attend Tiffin University. What are the top 3 things that students do for fun at Tiffin University? Campus housing is available for undergraduates and is mandatory for freshman. Housing deposit : $49.00. Housing deposit due : Apr 9. Housing deposit is partially refunded if student does not enroll.. Freshman allowed to have car. No pets. The average student pays $25,077 for tuition, fees, and other expenses, after grants and scholarships. Learn more about financial aid at http://www.tiffin.edu/finaid/. Estimate the net price for you at http://www.tiffin.edu/forms/netprice/. Tiffin University participates in the NCAA Division II for college athletics. Want more info about Tiffin University? Get free advice from education experts and Noodle community members. Are there tutoring resources available strictly for Tiffin University football players?